Super Savings Item! Free Shipping Included! 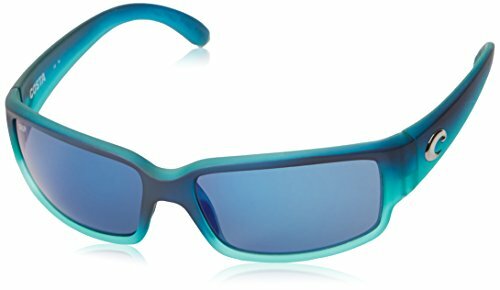 Save 39% on the Costa Del Mar Caballito Sunglasses, Matte Caribbean Fade, Blue Mirror 580Plastic Lens by Costa Del Mar at Lamont Design. MPN: CL73OBMP. Hurry! Limited time offer. Offer valid only while supplies last. Caballito is the name Panamanians give to a particular baitfish. It means little horse, which is fitting because these frames are ready to work. View More In Sunglasses & Eyewear Accessories. Caballito is the name Panamanians give to a particular baitfish. It means little horse, which is fitting because these frames are ready to work. Whether you're following a machete through the jungle, cranking on a sail or looking for an open hammock, caballito fits the bill. Flexible integral hinges, heavy duty nylon frame, hydrolite nose pads and excellent coverage make this frame ready for surf, sand or open water. Costa's 580 Polycarbonate provides high clarity, impact- and scratch-resistance along with lightweight all day wear-ability. Blue Mirror Polarized is best for bright, full-sun situations on the open water and offshore. Costa's co-injected bio-based nylon frame material is both tough and durable, while offering a comfortable fit. 100% polarization kills reflected glare and reduces eye strain. Built by hand and backed for life. Every pair of Costa Sunglasses includes a limited lifetime warranty. If you have any questions about this product by Costa Del Mar, contact us by completing and submitting the form below. If you are looking for a specif part number, please include it with your message.